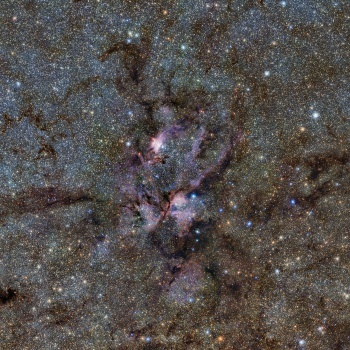 Infrared images of a "star nursery" have penetrated the clouds of concealing dust. The European Southern Observatory has captured an infrared image of NGC 6357, colloquially known as the Lobster Nebula, which reveals new information about a place where stars are formed. The Lobster Nebula is located about 8,000 light-years away in the constellation Scorpius, and is a region of gas clouds and dust where stars form. Those stars include massive, hot blue-white stars. Previous images of NGC 6357 taken by the Hubble Space Telescope and the ESO's Very Large Telescope were taken in visible light spectrums, but the infrared data has cut through the dust clouds that obscure visible light, showing plumes of purple gas stretching from the nebula. The clouds of red material previously observed in visible light pictures, from which the nebula had gotten the lobster nickname, are much less visible in infrared. One of the young, bright stars in the Lobster Nebula was Pismis 24-1, which was thought to be the most massive star known. New data, however, shows that Pismis 24-1 was actually three huge and bright stars. It's not the largest, but the three combined heavyweights are still the brightest object in the Pismis 24 star cluster, which formed in the Lobster Nebula. The images were captured using the largest and most powerful survey telescope available, the Visible and Infrared Survey Telescope for Astronomy (VISTA). VISTA is currently engaged in the VVV Survey - an effort to catalogue and scan the central bulge and some of the plane of our galaxy in order to understand the origin and structure of the Milky Way.